The incredible part of Adventure Time is not that they’ve put out so many episodes over the last decade, but rather how the show has improved in that time. Whilst boundless creativity was always the name of the game, back in season 1 the show was hampered by some pretty generic gender tropes. Basically, the boys went off and had adventures whilst all the girls were princesses in pretty dresses. Season by season, however, the writers have rectified this, to the extent where its representation of the gender binary mightn’t be at Steven-Universe levels of progressiveness, but it’s certainly much more inclusive. Let’s be honest: giving an eight-episode serialised story to Marceline and her mission to rid the world of vampires (‘Stakes’) might just as well have been a move specifically designed to please the likes of myself. Marceline the Vampire Queen has long been my favourite character, but it’s here she really gets to shine. This season also features what is quite possibly my new favourite Adventure Time episode: ‘The Hall of Egress.” This ethereal, hilarious conundrum of an episode feels like it was based on the writer’s dream. It sets a new high point for the show, both in terms of storytelling and visuals. Speaking of pushing the boundaries of animation, we get a stop-motion episode too. However, we’re given no reason for its existence, and whilst it’s a decent story, it doesn’t take particular advantage of the different style. One of my favourite things about this season is the lack of any completely off-the-wall, nutso episodes. 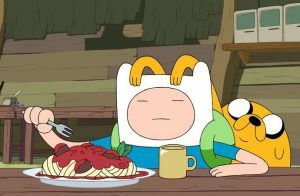 I appreciate that some adults might like to watch Adventure Time whilst partaking in their drug of choice, but I much prefer the show when there’s a semblance of a story. In fact, in the whole of season 7 there’s only one disappointment, ‘Crossover’. This is an addendum to ‘The Lich’ storyline that first began in season 4, and awkwardly begins with a story recap – something I don’t think the series has ever done before. Whilst some might appreciate it for tying up some lose ends regarding some paradoxes from previous eps, it did absolutely nothing for me. But one dud out of 26 ain’t so bad, especially when it follows up with the brilliant ‘Flute Spell’, properly introducing the awesome Huntress Wizard, who up until now has only been seen in the background of some episodes. As always, the visual fidelity of the Blu-ray is incredible, and it’s always better to enjoy Adventure Time in proper episode order, what with the multiple continuing storylines. Roll on the last three seasons! Adventure Time - The Complete Seventh Season is available now on Blu-ray and DVD from Madman. This entry was posted in TV Series and tagged Action/Adventure, Animation, Comedy, Fantasy, Science Fiction, TV series by Stuart Wilson. Bookmark the permalink. Writer: Tom Herpich, Steve Wolfhard, Kris Mukai, Adam Muto, Graham Falk, et. al.